Here's evidence that you shouldn't get rid of your old, un-developed film rolls. Isaac said that my family's old film would be ruined after so many years, but being a sappy nostalgic, I felt it was worth a try. For years I was my family's patron saint of neglected film, hording every un-developed roll, so no one would toss them out. 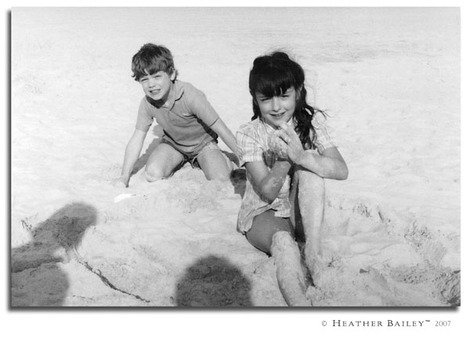 And look at what I found, a photo of my brother, Ryan, and I playing in the sand. (There was also a fabulous photo of my father posing shirtless on a dune buggie, 'fro and all.) It was so worth the expense of developing a few damaged rolls. I love this photo and the would-be-forgotten memories it carries. My parents took on us regular vacations to the beaches of Florida, most of which were too long ago for me to remember. Now, here's one memory I can come back to. Messiness. Sand everywhere. Good times. Ryan. Ryan was such a cutie and incredibly generous, with the most infectious laugh, but he could be a real pest too. Here we are, playing happily together. And, ladies, let me add that Ryan grew up to look an awful lot like Leonardo DiCaprio. But, alas, he's taken. His amazing wife looks like Raquel Welch. Figure heads. See the shadows of my parents' heads bobbing into frame? Hovering for a photo, I can just imagine the love behind the camera, "Smile, kids!" I've been there with my own children. It's black & white. Mom and Dad have never been fans of colorless film. How I stumbled across the one black and white roll they've ever taken, who knows? Those bangs. The day that I first had my short bangs cut as an adult, Isaac and I met up with my sister and her husband for a symphony performance of The Lord of The Rings that evening. I leaned over for my sister's first take on my new look and said, "Who do I look like?" After a thoughtful pause that yielded no reply, I gittily pronounced, "Little girl me!" Her response? "Oh my gosh, you're totally right!" I knew it. I knew I couldn't throw away that film.